Correction: The original version of this article only considered that the event could be naval exercise. Given the limited information available, the article has been updated to include the possibility of the event having been a demonstration or review. 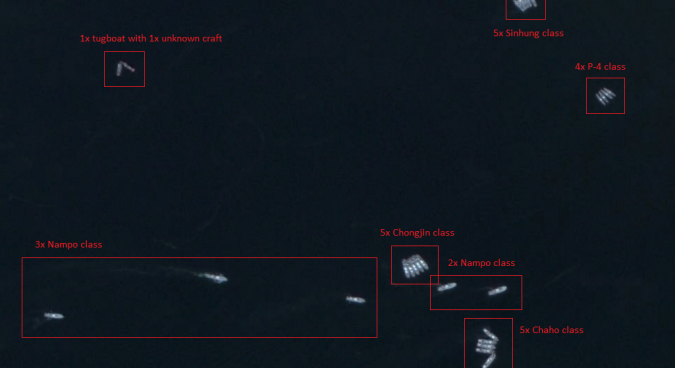 Less than two months after an escalation in tensions with their Southern neighbor, the North Korean military conducted a naval drill or demonstration near the city of Nampo, imagery from Google Earth has revealed. 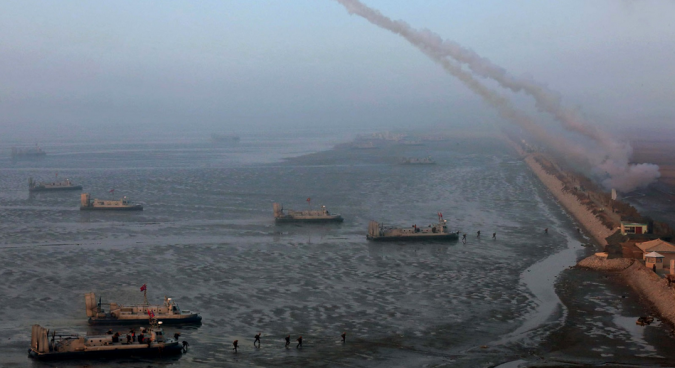 The event, which took place on October 5, featured more than 80 watercraft and included a range of different Korean People’s Army Navy (KPAN) elements including fast attack craft, submarines and air-cushioned landing craft. Although the exact specifics of the event such as objectives and compositions of different groups are hard to determine with the limited footage available (especially given the fact that it is unknown what phase the exercise was in at the time the photo was made), the naval craft present and their locations seem to indicate the aim was to pit two parties against each other in a hovercraft invasion of a coastal city. * Alternatively, it is possible the entire force cooperated in a mission against an entirely simulated foe, which has been the case in televised North Korean naval drills of the past. 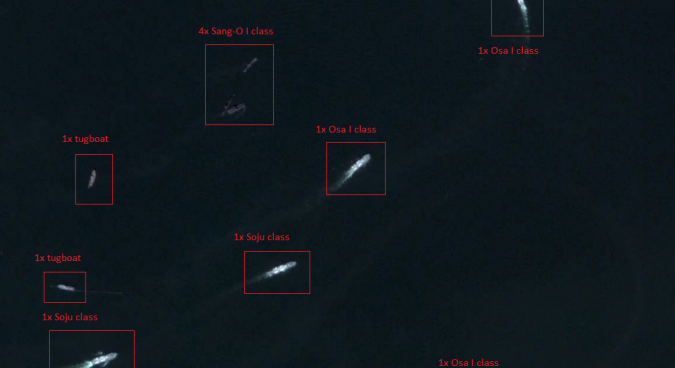 Considering the large Najin-class frigate moored close by with what appeared to be an onlooking crowd on it, parts of the event were likely watched by KPA and Party officials. North Korea’s vast military hovercraft force, in fact the largest in the world, is roughly divided amongst five global bases (two on the East coast and three on the West coast), the latest of which was constructed in early 2011 at a distance of just some 30 kilometers from South Korea’s Baengyeong Island. Air-cushioned landing craft are sure to play an important part in the North’s attack plans should war erupt on the Korean Peninsula, and at least 20 were thought to have been deployed to the newly built bases during the escalation of tensions in August this year. 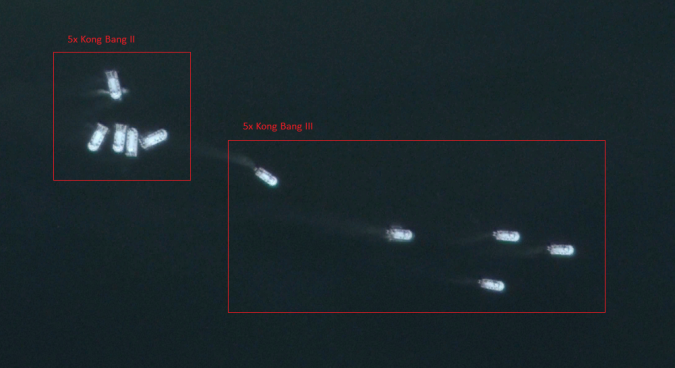 Of the two major indigenously developed types currently in use with the Korean People’s Army (KPA), 10 of each contributed to the event, with the smaller single-propeller “Kong Bang III” hovercraft leading the invasion ahead of the twin-propeller Kong Bang IIs, which measure around 20 meters in length. 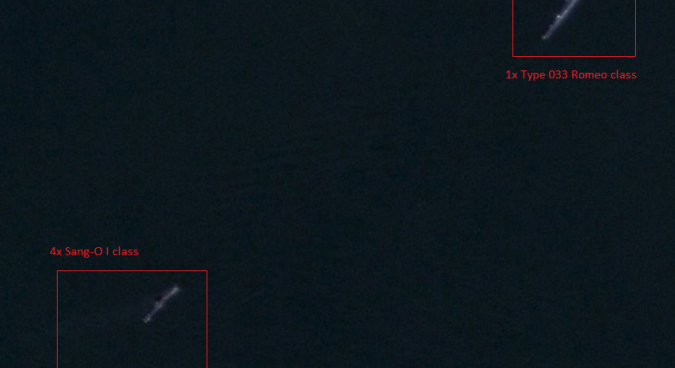 At the time the satellite image was taken this force was at a distance of roughly six kilometers from the main harbor area of Nampo and the ships and submarines assembled in front of it, where an additional Kong Bang III hovercraft was also moored, possibly as a reserve. So Bang II and So Bang III-class air-cushion landing craft. 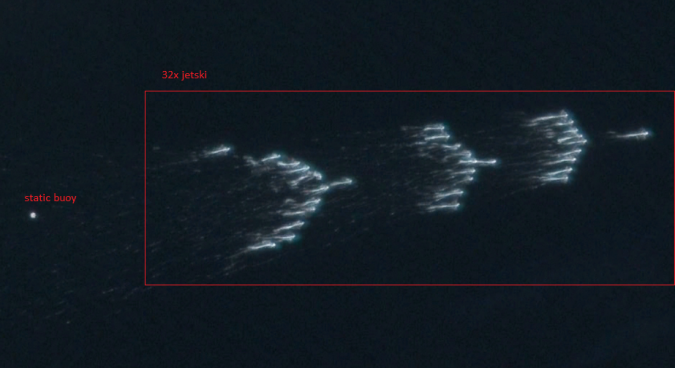 Curiously, a large formation of small watercraft believed to be jet skis can also be observed heading toward the rest of the participating craft. 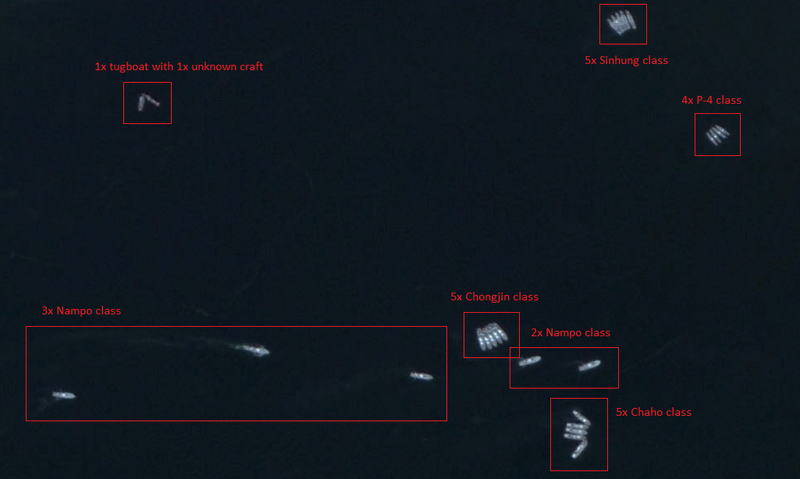 Whether these unorthodox vessels, arranged in three rough groups of 10, 10 and 12, are meant to approach larger naval ships and disable them is unclear, although this would definitely be an interesting asymmetric method of warfare for the North to explore. Alternatively, the jet skis could be employed to quickly infiltrate South Korean shorelines with North Korean Special Forces, although operational range and the craft’s limitations would impede its effective use in this role, possibly necessitating the use of a “mothership” which can carry the jet skis internally to the battle area. Among the forces assembled in front of the harbor itself were five submarines belonging to two different classes. The largest, of which just one of the four present on the West coast participated, was a Type 033 Romeo-class diesel-electric submarine which measures 77 meters in length, a copied vessel delivered by China but originally developed by the Soviet Union in the late 1950s. The other four submarines are all of the DPRK’s indigenously developed Sang-O I-class, a 34-meter-long craft that is slowly being supplanted by its lengthier successor, the Sang-O II. The role of these submarines in the exercise is uncertain, as they are mostly of use against larger naval craft such as the ROKS Cheonan which is believed to have been sunk by a torpedo fired by either a Sang-O-class or a smaller Yono-class submarine on March 26, 2010, killing 46 seamen. However, multiple variants exist including a confirmed infiltration type, one of which was captured in 1996. No naval craft above 43 meters in length (aside from the Type 033 Romeo–class submarine) appeared to take part in the drill, so it might be possible that, as was witnessed during reported exercises in the past where islands were repeatedly torpedoed, the submarines’ targets may have been simulated entirely. 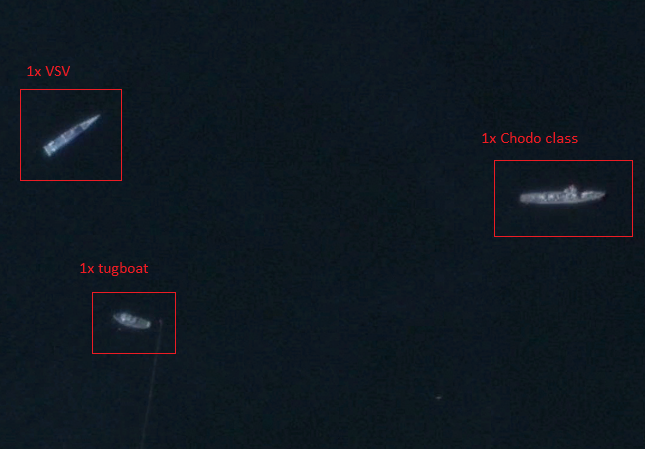 Smaller supporting naval vessels, usually measuring around 25 meters, were also present in a large variety of types. Nine of these craft carried torpedoes, comprising four of the older Kusong/P4-class torpedo boats (the latter referring to their original designation and the former to that of the North Korean copy) equipped with two 450mm torpedoes, and five Sinhung-class torpedo boats outfitted with two 533mm torpedoes. 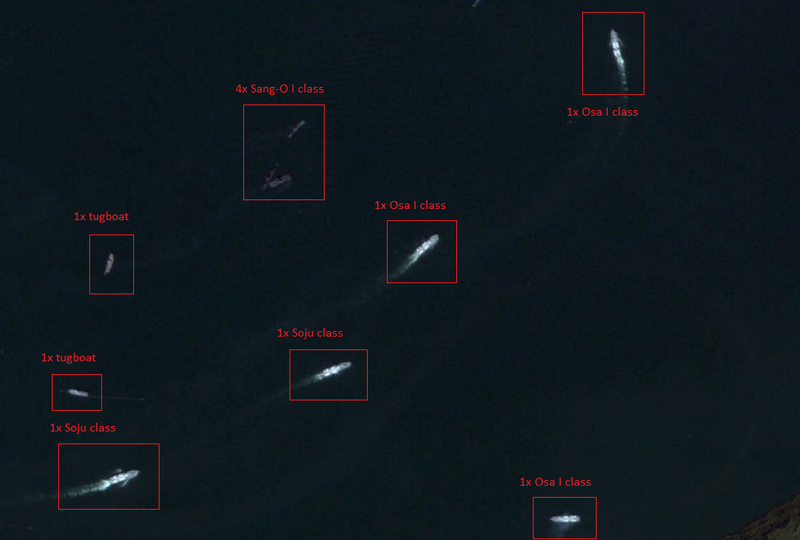 More signifying of North Korea’s relatively unorthodox naval strategies are five Chaho-class craft equipped with 122mm multiple rocket launchers and another five Chongjin-class craft armed with 85mm or 100mm gun turrets, possibly of the same type as was mounted on a patrol boat that scored an immediate hit at the start of the Second Battle of Yeonpyeong on June 29, 2002. Finally, five Nampo class gunboats equipped with either two twin-barreled 14.5mm turrets or their modern 14.5mm rotary cannon replacements provided light firepower, and, considering their capabilities as landing craft, may have reinforced the attacking force. Five larger fast attack craft (FAC) in the form of three Soviet-legacy Osa I-class ships and two of their lengthened North Korean copies designated Soju-class by the U.S. Department of Defense formed the heart of what was presumably the defending force, carrying four anti-ship missiles derived from the 1960s P-15 Termit each, as well as two AK-230 twin-barreled 30mm close-in weapon systems (CIWS) guided by a Drum Tilt radar. Although antique by modern standards, large numbers of these FACs combined with their older Komar-class predecessor also still in use with the KPAN might temporarily overwhelm South Korean defenses and score some hits, especially if they are equipped with advanced variants of the P-15 Termit. The sole larger ships taking part in the event were a single Chodo-class gunboat at 43 meters length, and a 34 meters long very slender vessel (VSV), which quite likely was the most modern component of the drill. The first of these two combines the 85/100mm gun turret also seen on the Chongjin-class with two 37mm turrets on the rear and a ZPU-4 anti-aircraft mount, although it is not unlikely its armament has been slightly upgraded since it was last seen in video footage. The second craft is one that has seen the light of day only since 2014, and uses a very peculiar design to reach very high speeds and a large degree of stealthiness. This type of vessel is based around a very long and thin cylindrical hull to allow it to pierce waves rather than go over them, which makes for a much smoother ride, due to which higher speeds can be reached without stressing materials, equipment and personnel overly much. 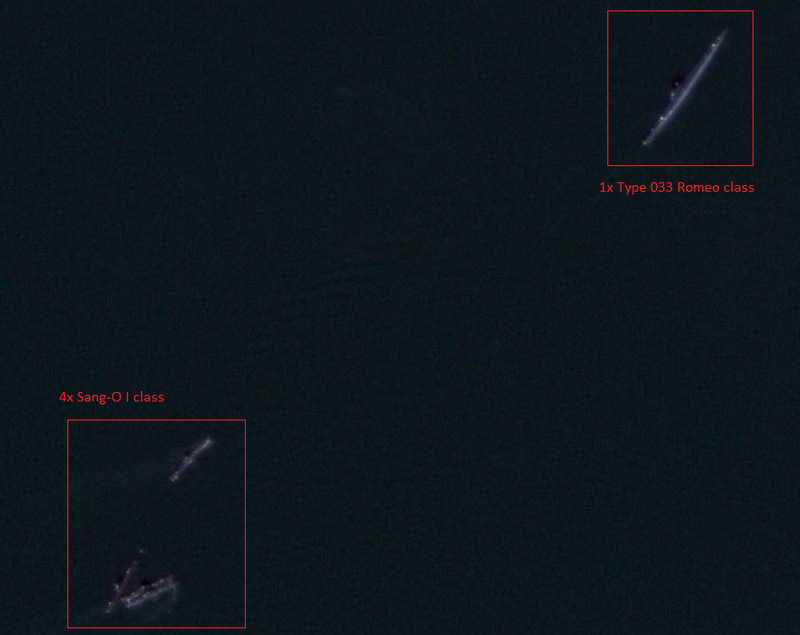 Although this design certainly isn’t unprecedented, North Korea is the first to produce it in a strictly military role, equipping ships in this class with a range of different weaponry, the specific types of which are unfortunately hard to identify on the example seen on the October 5. Nonetheless, development of this new class of warships is advancing at a swift pace and it is not implausible they will at one point present the South Korean navy with an unexpected challenge, be it during all-out war or smaller scale confrontations such as the ones of the previous two decades. Ultimately, possibly the most notable aspect of the drill wasn’t in the participating naval craft, the simulated objectives or the location where it took place, but in the fact that it was not televised or even reported. Where most known military exercises and reviews are widely publicized and described by North Korean state media in an attempt to instill an image of combat readiness and ongoing modernization into foreign navies and, more importantly, the international public, it would appear the goal this time was solely propaganda for domestic consumption, to improve the skills of crew involved and to test out novel tactics and weapons designs. The timing of this event is also no coincidence: At less than one and a half month from August’s volatile confrontation with the South its significance is obvious. In the end, it portrays a much more convincing image of a nation still trying to keep its navy up to date with that of its nemesis than any amount of the standard propaganda could, and shows the DPRK might have been more serious about the possibility of war than some have speculated. Note: Nampho, where the exercise took place, actually lies a few kilometers upstream of the Taedong river. Subscribe to read the remaining 1562 words of this article.